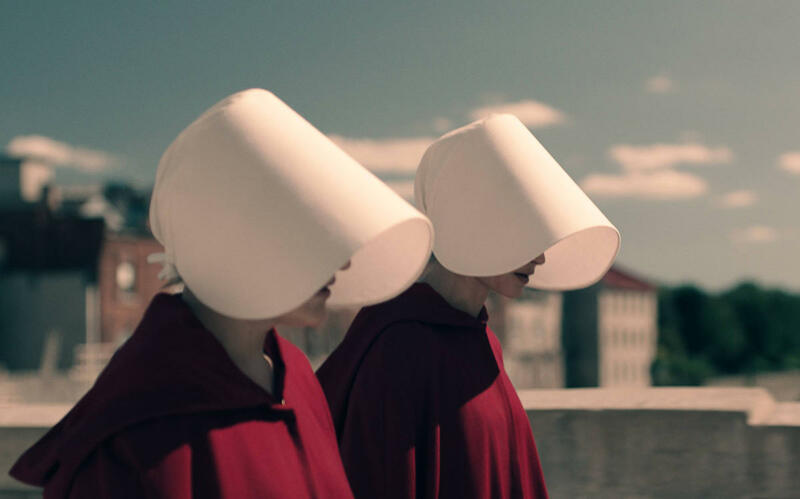 Hulu has begun airing a series based on Margaret Atwood’s The Handmaid’s Tale and the critics are falling all over themselves in proclaiming how timely and relevant the program is in Trump’s America. The Handmaid’s Tale, for those fortunate enough not to have encountered it, is a dystopian novel set in the “Republic of Gilead”, a future North American nation in which Christian fundamentalists have seized power. Naturally women are horribly oppressed in Gilead, since that is what Christian fundamentalists most like to do. Women are chattel who are forbidden to work outside the home or to have bank accounts. There is an epidemic of infertility caused by environmental pollution and those women who are still fertile are pressed into service as “handmaids” compelled to give birth to women incapable of having their own children. As you can see, The Handmaid’s Tale is timely and relevant, for women living in Iran, Saudi Arabia or Afghanistan. Since Trump hardly ran on a platform of disenfranchising women, the novel is probably not particularly relevant to the experiences of American women, whatever Atwood and her fans might believe. The purpose of dystopian literature, and science fiction in general, is not to predict the future but to highlight circumstances and emerging trends in the present. If it had been Margaret Atwood’s intention to highlight the oppression of women in the Middle East by portraying a similar situation in a more familiar context, much as George Orwell highlighted Stalinist tyranny by placing it in the more familiar context of England, than her effort would be laudable. That is not what she was trying to do. By her own account, she was trying to show what the “religious right” intended to do to women when they gained power. The Handmaid’s Tale was published in 1985, at a time when the Moral Majority seemed to be on the ascendant, so it might have been timely and relevant then; except that not a single prominent figure on the “religious right” was proposing anything at all like the subjugation of women in the book. If treating women like chattel had been on the agenda of the Christian Coalition, I doubt very much if it would have had any influence on politics at all. And again, Trump is hardly a fundamentalist Christian, nor did he campaign on reducing women to brood stock as part of his program to Make America Great Again. As a man of the left, George Orwell knew from personal experience the totalitarian tendencies of most left wing movements. He knew what he was writing about when he wrote 1984. He was able to make the setting of his novel match the real life circumstances of totalitarian governments like the Soviet Union under Stalin and Nazi Germany. He believed, with good reason, that Britain was heading towards a totalitarian socialist state. We may not currently be living in Big Brother’s Oceania, but in an age of mass surveillance and bigger, unaccountable bureaucracies, we should certainly be aware of the possibilities. Aldrous Huxley had considered very carefully the possible changes that advancing technology might bring to society. His Brave New World is a study of how advances in contraception, cloning (though the word hadn’t been coined at the time) might change family life. If we can design each person according to plan would we design different people for different jobs? What would the concept of equality mean if some people are designed before birth to be the leaders while others to be workers? Huxley also explored the implications of freedom of thought in a world in which thoughts are conditioned by persuasion techniques far more advanced than the crude advertising and propaganda of our time. You might not need the Thought Police if every thought in every head is put there by years of conditioning. It is possible that something like Brave New World might really be in our future, perhaps closer than we might imagine. In contrast, Margaret Atwood knew nothing about the goals and aspirations of conservative Christians when she wrote The Handmaid’s Tale and there is no sign that she has bothered to learn anything about them in all the years since. Her vision is one that simply does not match the reality. No prominent Christian leader of any sect or denomination has come out in favor of disenfranchising women. Christianity is not the religion that teaches that a woman’s testimony is worth half that of a man’s. Historically, women have generally had a higher status in the Christian West than in any other civilization. It is true that women have often been discriminated against and patronized in the West, but women have rarely been treated as chattel or worse to the extent they have in East Asia, or the Indian subcontinent, and especially the Islamic world. It is in the Christian West that the idea that women ought to be treated as actual human beings, and even protected arose. Only in the West could anything like feminism come to be. The Handmaid’s Tale is a fantasy. I think it is poorly written, but that is just my opinion. Perhaps others may think it a classic. Everyone is entitled to their own opinion about the literary quality of the work, but please don’t insult my intelligence by saying it is in any way timely or relevant to contemporary America. Could The Handmaid’s Tale Actually Happen? (theatlantic.com) It is happening throughout the Middle East. Margaret Atwood Doesn’t Hear Complaints That The Handmaid’s Tale Is Unrealistic Anymore (time.com) That is because most of the people she listens to are idiots. According to the Washington Examiner, sales of 1984 have increased dramatically recently. Sales of George Orwell’s “1984” are up 69 percent on Amazon, according to a list on the website. The book marked its 60th anniversary on June 6 amid a flurry of real-world news stories on secret government surveillance. Amazon lists the paperback version of the sci-fi classic as the 19th biggest book on its Movers and Shakers list. The current sales rank is 110. The list identifies the biggest gainers in sales rank compared to 24 hours ago. Update: As of 3:22 p.m. EDT, sales of Orwell’s “1984” are up 91 percent on the Amazon Movers and Shakers list. I guess that George Orwell’s dark vision of a totalitarian government that watches its citizen’s every move doesn’t seem like fiction anymore. Incidentally, Ayn Rand’s Atlas Shrugged has also been making record sales for the past several years, for the same reason. Interesting times we’re living in.